I never knew being sick could be so rewarding! Actually it is my sister who suffers with Crohn’s disease. Yet throught it all we’ve had a lot of trips to the ER, met Mike McCready of Pearl Jam, and been to San Jose for the Rock and Roll 1/2 Marathon! I spent Wednesday in Olympia with the Crohn’s & Colitis Foundation as they met with legislatures throughout the day sharing their stories and issues that are important to families touched by IBD (including my own). Advocating for state-based legislation that ensures treatment decisions are kept between the patient and their medical professional not the insurance companies. Next year the group hopes to present a bill addressing those concerns. With ACA possibly on it’s way out the state might well end up being the salvation for those suffering from Crohn’s disease and ulcerative colitis in our state. It was interesting to note that more than half of the members we visited (or their liaisons) had an indirect connection to someone suffering from the disease. There is no question that CCFA will be a force in Washington – stay tuned! Visit the CCFA on our Facebook page. #IBDadvocacyWA! “Providing Hope, Inspiring Action”…It was a day of giving for the Crohn’s & Colitis Foundation Northwest Chapter as supporters gathered for the annual event that raises funds and awareness in support of research, patient progress and treatment progress for this most debilitating disease. Having a sister that suffers yet lives fully with the illness, it is always heart-wrenching and heart-warming to hear stories of those who have conquered the disease in their own way. Erin Stedman shared her story which was totally different than that of her sister who also has the disease. Erin somehow managed her pain and suffering while planning a wedding and later having a baby. Surrounded by family and love definitely pulled her through. And then there was Trina who received the McCready Family Award whose story was just as inspiring. See all the images here. On Thursday, April 24th hundreds of guests arrived at Olive 8 for the 2014 Annual Benefit Luncheon for Crohn’s & Colitis. Sandra Kim, MD presented a lively presentation on PROKIDS – discussing research and results of studies with young children with the disease. Tony Ventrella was engaging as he shared wit and widsom on living with challenging conditions no matter what the age. Mike and Ashley McCready presented the 2014 McCready Family Award to Lisa and Norm Judah; outstanding volunteers who are dedicated to helping others living with chronic illness. 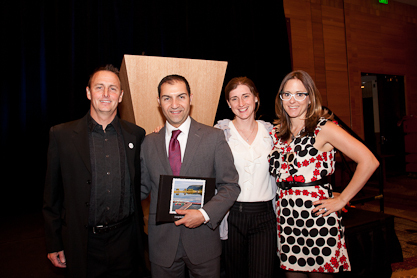 I myself would like to thank CCFA for their work in the Seattle area. Click here to see all the images. The dice were flying and the bidding was furious at the annual Casino Night & Auction benefiting the Crohn’s & Colitis Foundation here in Seattle. Over $60,000 was raised with patrons walking away with VIP Pearl Jam concert tickets, Dinner with Nancy Leson, a Sayulita getaway just to mention a few. Crohn’s disease and ulcerative colitis affect both children and adults. My sister was diagnosed over 30 years ago and today lives a very active life despite the occasional flareup and trip to the ER. Having a local chapter in our own backyard has been most helpful. Find out more about Crohn’s & Colitis by clicking here. Download your complimentary social media files here! Camp Oasis Magazine now available! 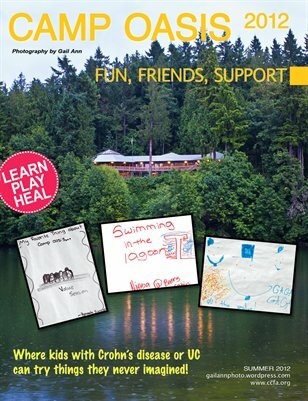 Camp Oasis is a place where kids with UC and Crohn’s disease can go and play and just be kids. Sponsored by Northwest Chapter Crohn’s and Colitis Foundation, Bellevue Washington. Proceeds from the sale of this magazine benefit the local chapter. I support the Crohn’s & Colitis Foundation because my sister has dealt with the disease for over 20 years. Giving back to CCFA is an honor. Meeting special people like Mike McCready and his lovely wife, the kids at Camp Oasis is all very rewarding. Once again I was on hand to offer my photographic skills in capturing the annual benefit luncheon. 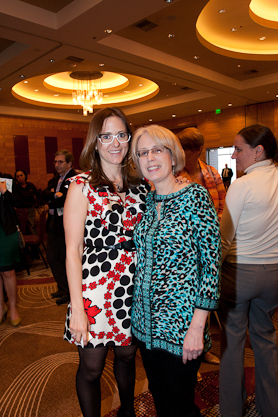 You can view the images from the luncheon be clicking here. Below Ashley McCready and Barb Wodzin pose for a photo at the luncheon. 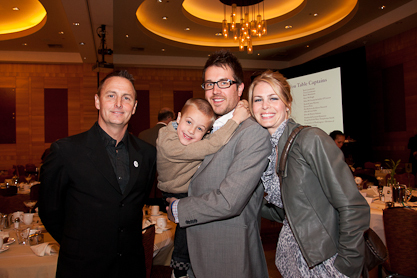 The Kennard Family get a chance to meet Mike McCready. Their yound son suffers from Crohn’s just like Mike.